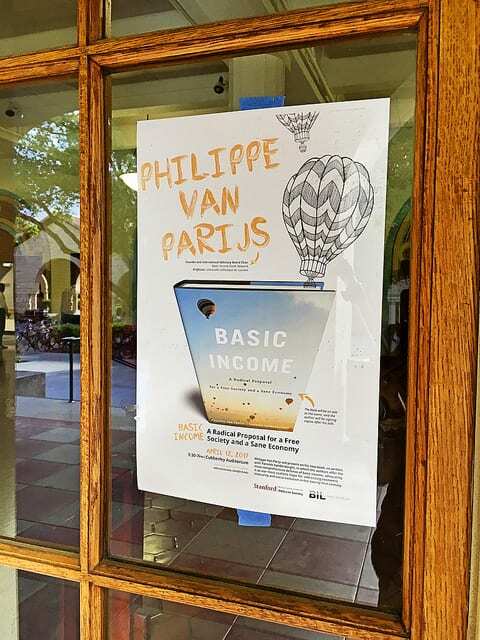 On Wednesday, April 12th, Philippe Van Parijs, co-founder of the Basic Income Earth Network, Emeritus Professor at the University of Louvain and former Director of the Hoover Chair in Economics and Social Ethics, presented his latest book on Basic Income at Stanford University. He offered a powerful defense of UBI as an instrument of freedom and argued that it can be economically sustained and politically achieved—especially if political communities consider starting with a small UBI. Basic income should be designed, he argues, to go alongside publically funded services, such as quality healthcare and education, and should be given to all fiscal residents of a country. 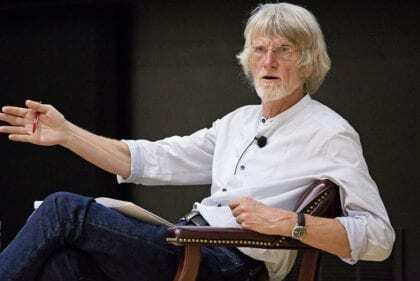 “I’ve listened to criticisms and questions about basic income in five continents and seven languages,” Van Parijs told an audience of more than a hundred students, teachers and members of the broader community. He remains convinced that the policy has no fatal flaws. 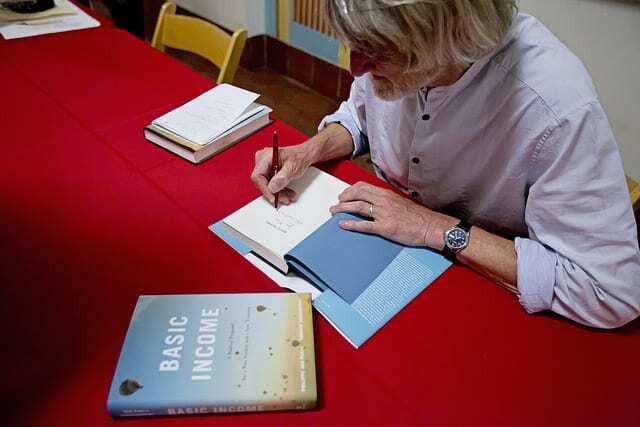 Co-written with Yannick Vanderborght, and with the heroic title Basic Income: A Radical Proposal for a Free Society and a Sane Economy, the book is an absolute must read for basic income enthusiasts and critics, advanced and beginners alike. As the idea of UBI spreads faster than ever throughout the world, it can be hard to keep track of all the major developments in the academic and political worlds. Their book is a seamless solution to this problem. Over eight insightful chapters, the authors offer the most comprehensive survey ever produced of the scholarship surrounding the recent and less recent revivals of the old idea. Van Parijs and Vanderborght trace back the roots of the policy proposal in the history of public assistance and social insurance, as well as in utopian thinking from Thomas Paine to Charles Fourier, and Martin Luther King. As a scholar, writing and teaching on basic income, I cherish the more than 100 pages of notes and references at the end, which prove to be inexhaustible sources of knowledge. We learned from Philippe’s talk more about the long journey that led Philippe where he is now. From his first (disappointing) encounter with Rawls over breakfast to his (equally disappointing) encounter with Dworkin in a taxi. On those occasions, both political philosophers challenged the view that liberal egalitarian justice requires a universal cash payment. He recounted for us how he nonetheless ended up convinced that basic income was the instrument of freedom. In the book, the authors argue that UBI enables a fairer distribution of the most important good of all – the real freedom to lead one’s life as wished, through work and outside work. They make the case that UBI is ethically justifiable by taking on the most pervasive objection of all – that unconditional cash would allow an unfair freeriding of some on others. Vanderborgth and Van Parijs also offer answers to the many other questions and objections to UBI that come up again and again in political debates. For a start, how would people who believe that work is a moral duty and see the welfare state as a moral hazard ever agree to a system where we don’t even require recipients to demonstrate a willingness to work? And even if we could get them to agree, how could we afford it? And how could such system be sustained? Presumably, if people get money for doing nothing, they will stop working, which will in turn make it impossible to afford a generous UBI. Should we give it to migrants? Won’t it create a dangerous pull effect? And, what about the global poor anyway? Each time, they dissect the objections and scrutinize the questions with the rigor of philosophers, the wise perspective of historians, the rationality of economists and the pragmatic outlook of political advocates. We also learned more from the talk about how UBI can help build a sane economy. Automation and globalization are important threats to employment and workers’ rights. 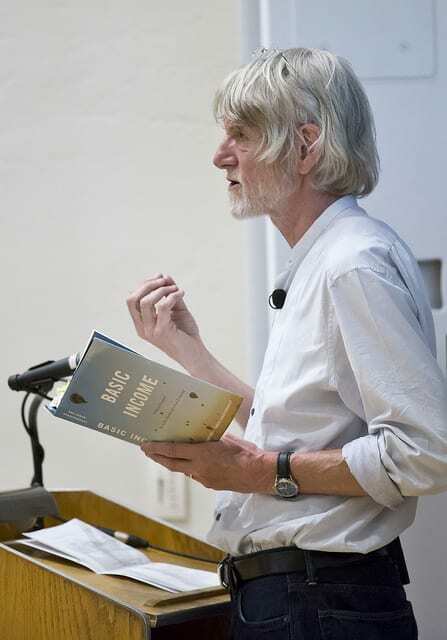 Van Parijs argued that UBI could be a possible solution to support displaced workers – allowing them to retrain, and giving them access to the means to lead a decent life. He also shared his vision of a form of work-sharing that could help prevent two opposite problems – the fact that so many work too much and burnout, and the fact that so many are depressed for being out of work. A ‘sane economy’, then, is one that works for the many and does not make so many of us stressed and unhealthy. I remain convinced that one of the most exciting promises of basic income is that it can help us see a way out of the current dominant regressive mindset on public assistance. Existing benefits systems often condone an obsession with screening out a supposedly undeserving underclass: the “welfare queens” and benefits scroungers. At worst, politicians take advantage of this paradigm to get elected, promising to screen out the free riders. At best, they address the problem in a shortsighted way, making benefits even more conditional to show that they are preventing scroungers from abusing the system. In doing so, they strengthen the myth that benefit claimants are indeed undeserving of assistance. Van Parijs and Vanderborgth’s book proposes to try out the opposite strategy to help rebuild the welfare state: doing away with conditionality to avoid benefits traps while also rejecting means testing, so that more workers also benefit from public assistance. The authors would prefer if everyone had access to the highest sustainable basic income, but they fear basic income will only work with a great deal of realism and pragmatism. The challenge is to strike the right balance between the ideal and the feasible – without compromising the vision and without wishful-thinking on what is achievable. For basic income to work, Van Parijs said at the end of his talk, the world needs visionaries, enraged activists, and opportunistic thinkers to work together. But don’t worry, he added, “I am sure that all three kinds can be found in this room”. *** A longer review of the book by Juliana Bidadanure can be found on the Stanford Social innovation Review website here. *** For more on the event, please read Sara Button’s review here.